Good morning! This week, I'm sharing a sort of response poem to the sestina I shared last week. Or maybe last week's poem was a springboard, and this is the leap. In a way, I guess, this week's poem is a leaping poem. But I've fiddled with it enough...for now. Let's roll! potato," but the words mean something new. covered us and we were miserable. it out. the words will come and keep coming. Earlier this week, Nin wrote a great personal essay on dealing with the eye condition called strabismus. But what led me to Nin years ago for a Poetic Asides interview was her poetry. Nin specializes in prose poetry, and I think that form demands the most from poets, because there are no line breaks to hide behind. What I mean is that a great prose poem has to use other poetic devices to succeed. The collection starts with these lines: "Night after night, a girl dreams of falling. Falling from planes, clouds, swings. Always falling." 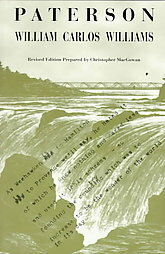 In this collection that includes poems like "Sleeping with Houdini," "Sleeping for Kafka" and "The Bed and I," there is a constant shuffling and re-shuffling of the bed-scape. And the tricks and illusions keep coming at the reader one after another, which makes this book great fun to read. Before you know it, you'll hit the end and start searching for the parts that won't let you sleep. I have a confession to make: I usually don't enjoy poems that go longer than one page. Blame my short attention span, blame my head trauma, but longer poems usually just bore the heck out of me. That said, those few long poems that hook me (and keep me hooked) end up being among my favorites ever. Such is the case for Paterson, which was originally published in five separate books. Ironically, the household name poem for which Williams is best known is the super short (16 words!) "The Red Wheelbarrow." In Paterson, Williams was playing with the idea "that a man in himself is a city, beginning, seeking, achieving and concluding his life in ways which the various aspects of a city may embody." Of course, I just love the poetry of this long book, which shifts seamlessly from short line breaks to journalistic prose and back. Note: Links in this post to books are affiliate links. However, I do not mention these books just to make a profit. They are either books I'm connected to or ones I truly love. All other links in this post are not affiliate links. Beautiful line about the "naked moon." Thanks for sharing. And, about long poems, I feel the same way. Hello, interesting thoughts about language, it comes in different forms from generation to generation but, in the end we all need to figure it out. Thanks for sharing! Beautiful poem, Robert. It reminds me so much of those years with young kids, how they would laugh at just the taste of a word in their mouths. I love that they can hold hands and chew gum at the same time. Thanks so much for talking about my book, too. I was shocked to see it there with Paterson- and below your lovely poem . . . Thank you, Adina! Yes, I think the longer the poem is the more it should be working to keep my attention. Truedessa, thank you for sharing! We all do need to figure it out a little, but there's also something sweet about never completely figuring it out. I surely haven't. Thank you so much for the kind words, Nin. 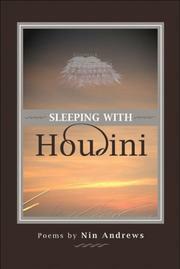 It was a difficult decision over whether to feature Sleeping With Houdini or Why They Grow Wings; I love both!